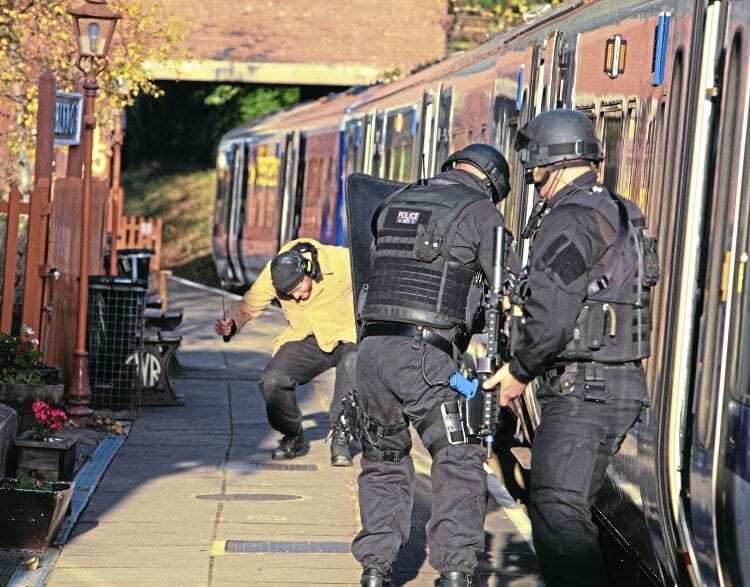 Under strict secrecy, Chiltern and the TVP contacted the C&PRR to see if the three organisations could join together to provide realistic training scenarios for TVP firearms officers. The training days began using four Mk1 carriages for briefings carried out by C&PRR volunteers and also TVP firearms instructors. The police were walked along the cess around the train and armed squads practised boarding the Mk1 from the cess using ladders. This was timed to end before the Class 165 arrived, piloted by C&PRR volunteers, who also provided crossing keepers for the four-mile trip to Chinnor, where Chiltern’s staff held driving cab and carriage-layout familiarisation sessions for the police. Several scenarios took place, with C&PRR volunteers and Chiltern staff acting as passengers/hostages as required. They were rescued variously from knife-wielding terrorists, gunmen, serious crime suspects, and unruly passengers, the suspects being either ‘shot’ or overpowered on the platform.